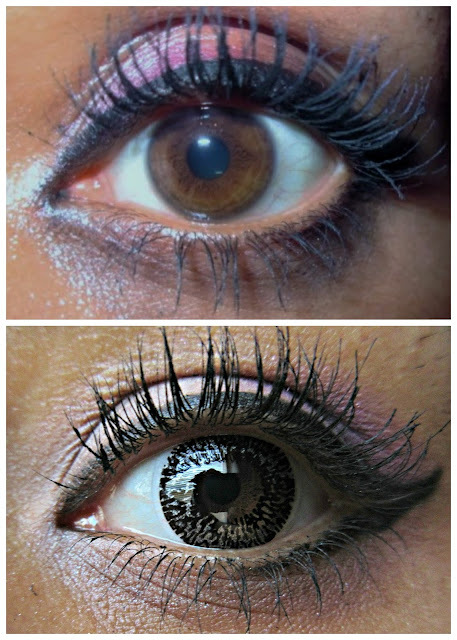 As my readers know, I have reviewed quite a few different lenses from Spooky Eyes. The website has so many cool colored contact lenses to pick from. You can find the perfect pair for Halloween or a costume party or just for everyday wear. They have so many different colors and a huge variety of designs to pick from. Also, the prices are very reasonable. All of their lenses are PLANO which means, they are all for cosmetic purposes and not for correcting vision. However, if you do wear glasses, you can always wear a pair of their lenses right under your frames like I occasionally do. My latest pair of soft lenses received for reviewing purposes are the Glimmer Black & Silver Contact Lenses. Add futuristic glamour to your look with our gorgeous glimmer black and silver contact lenses. These stylish contact lenses have a glossy silver finish and really make a statement. That's a picture of my eye without any lens in it and then the bottom is of my eye with one of the Black & Silver Lens in. Now, these lenses actually look cooler in the case than when actually on my eyes. They do make a bit of a dramatic difference in person though. My eyes look super dark, almost completely black when I have them on. That can be a bit freaky for some people, especially those who know me since my real eyes are a medium honey brown. They do make my eyes look a little bigger, but not much. Are they comfortable? Why, yes, they are, which is what I've come to expect from all of the lenses that I've been sent from Spooky Eyes. They don't irritate my eyes and can be worn for several hours comfortably. These are okay for everyday wear, in my opinion, if your eyes are medium or dark colored because they don't look too abnormal...However, they might in bright lighting. If you have really light colored eyes, then these are probably better to wear with a costume. You can see all of the lenses available from Spooky Eyes by visiting their website.